To perform unlocking operations it is necessary to choose two positions in "Open positions" window (by "Ctrl" + left click). 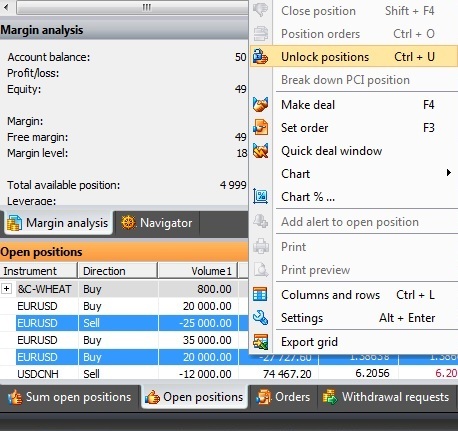 After choosing, you need to right-click to call the context menu, where you need to select the "Unlock positions" option. For example, let us perform unlocking operation on two open positions: Sell EURUSD with volume of 25 000 Euro and Buy EURUSD with volume of 20 000 Euro. In the opened "Unlock positions" window press "Unlock" button. The result of this operation is closure of two positions and opening of a new Sell position with a volume of 5 000 Euro, which is reflected in the account balance. 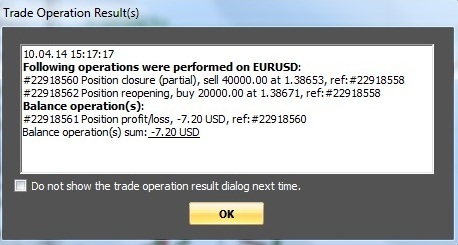 It can be seen in the "Trade Operation Result(s)" window (if the option of showing operation results is set in terminal settings).